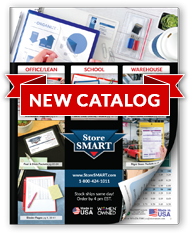 Are you eager to take advantage of StoreSMART's vast array of magnetic accessories, but don't have much space for a whiteboard? Don't lose hope! If you can find a few inches of counter space (or a bit of room in your suitcase), you can use one of our Magnetic Calendar Dry Erase Boards with Easel Backs. The convenient 11" x 14" size can still send powerful motivational messages—and help keep you organized. A blank perpetual calendar is pre-printed on each, allowing you to fill in the month and day and start planning. Attach the included 10" cardboard easel back to stabilize the dry erase board on any flat surface, or stick on the included magnetic squares in order to mount the calendar on a filing cabinet or metal door. A selection of our most popular visual management magnets are included, so you can hit the ground running. Never be without a dry erase board again! 11" x 14" size is great for the office, retail locations, and home. 10" cardboard easel back is easy to assemble and install—just peel off the paper backing, stick it on the dry erase board, and fold. Flattens again when you're done! Blank perpetual calendar is pre-printed on the board, giving you the choice to fill it out with whatever month you need. Great tool for forward planning. Package includes three 1" communication face magnets, two 1 ¼" black magnets, and a dry erase marker. Four magnetic squares also included—adhere them to the back corners in order to mount your dry erase board on a metal surface. Can be paired with the attached easel back for ultimate versatility.